In this game, I learned a lot about how important decent dice rolls can make or break even the best of strategies. At the outset, I have to note that my opponent had horrendous dice rolls at critical points in this game. My level of risk-taking is moderate-high. I generally don’t play it safe if my army and warcaster support an upfront, aggressive strategy. In contrast, I play it safe if I’m unaware of the rules/abilities of the enemy models. 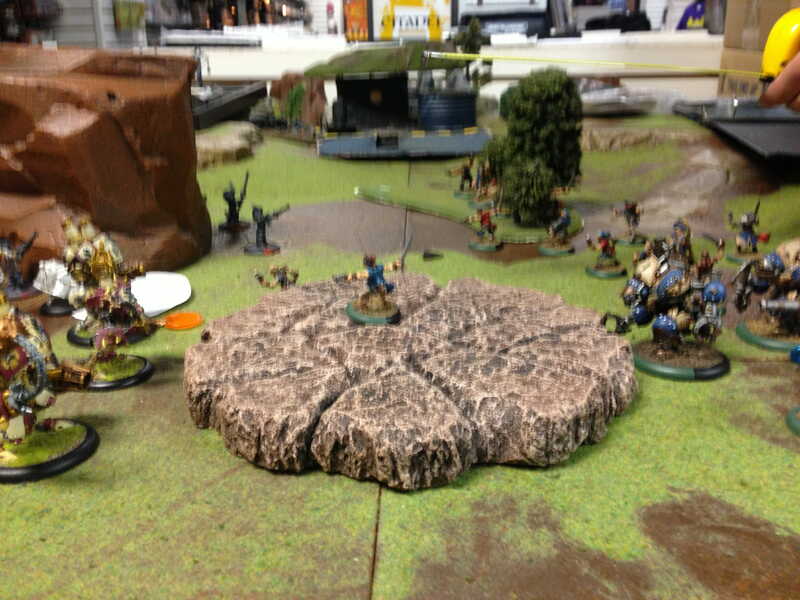 The drawbacks of playing Reznik are in my opinion his slow SPD 5, his medium-sized base, and his limited FOC 6, which gives him a pitiful 12″ control area to work with (as compared with my other Menoth casters, i.e., Harbingers, Kreoss, Severius). The advantages of playing Reznik balance out his gameplay weaknesses. He is a bundle O’ fun. So much fun in fact, I can’t contain my enthusiasm whenever I think about how I’m going pull off that Wrack-making maneuver (see link for the Excruciator wracking ability). String ’em up! Reznik…. 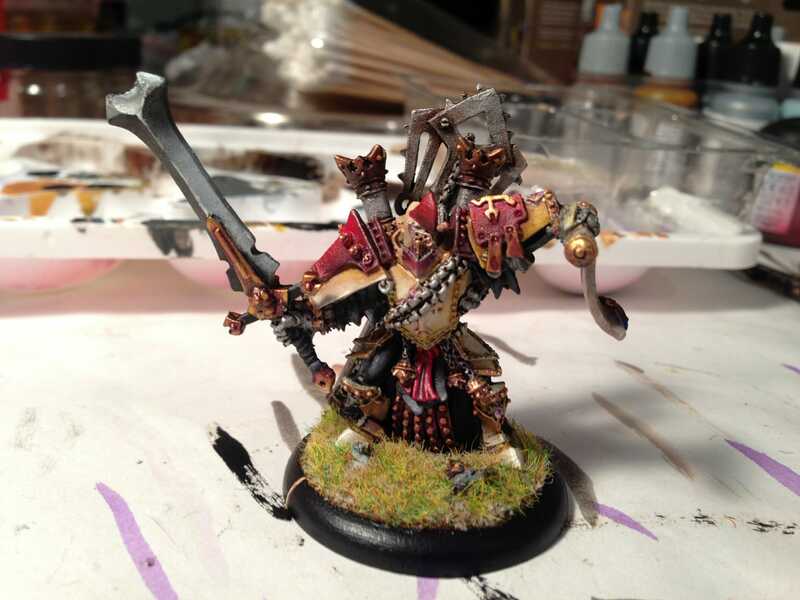 one of the most fun-to-play warcasters in the Menoth force. So, I’m still working on improving my battle report visually. It all begins with Reznik hiding behind his warjacks and Gorman’s cloud effect. This strategy appears to emerge in all my games; Reznik hiding. Then again, I was facing a horde of pirate-themed shooting craziness. The terrain was setup without any real concealment that I could advance Reznik behind. A dilemma I hope to remedy with the fielding of a more models at 35pts, or the addition of a massive based model, like a colossal. Reznik…. I hate playing him so cowardly! Reznik hiding (until he can advance far enough upfield to smack something) behind a cloud effect and Crusader heavy warjack. Cowardly or tactical-minded? 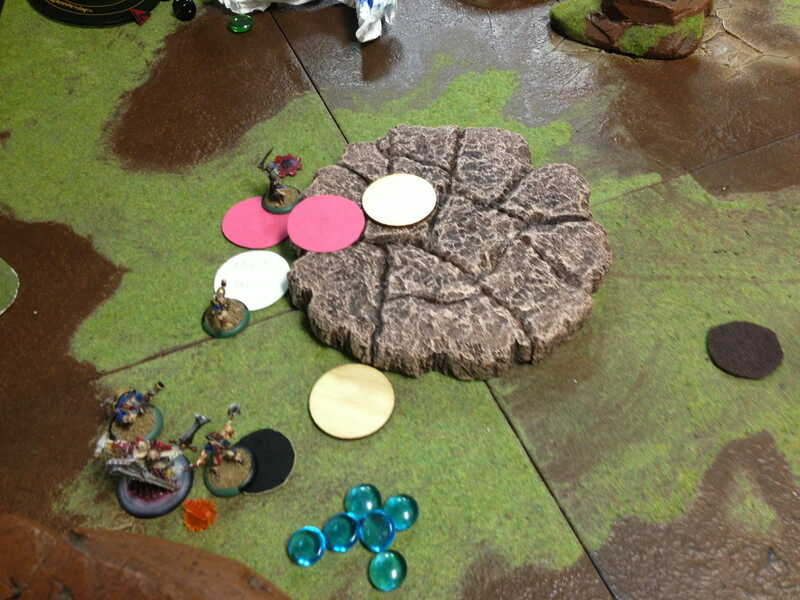 My opponent takes his time to figure out a way to destroy my support pieces, including my choir members and Gorman. With all those Sea Dogs pinging away at my Choir, by turn 3 I’ve only got one left who flees in fear after the massive loss of his comrades. By turn 3, I’ve lost Gorman, effectively all my choir and somehow my opponent has run the Bucaneer behind my front lines to my rear flank. 3 out of 6 of my knights exemplar are dead from the Sea Dog shooting, which is mightly effective the entire game. Reznik is exactly 7″ away from the Bucaneer and is able to walk up and, with Engine of Destruction, take down the Bucaneer. My Vanquisher and Repenter take free-strikes from Sea Dogs so they can disengage to fire their fire-based weapons. These two warjacks kill a number of Sea Dogs and set a few models on fire, including the Freebooter and Mariner. Although I splash McNaile with fire continuous effect for several turns, he doesn’t bite the dust until the last turn of the game. That is one tough cookie….Actually, the entire pirate infantry force is a really hard nut to crack. Tough, tough, tough. All those 5,6 dice rolls…. the bane of my game. Mercenaries advancing on the center field on top of a hill on turn 2… pirates! The Convent of Menoth lives to the latter stages of the game, prevents some of the most fearful of the power attacks, i.e., slam, throw, that I was expecting. Sure ‘jacks can get thrown or slammed, but immunity to knockdown takes the wind out using those strategies without extra-considerations by my opponent. This helped me a lot this game. The reclaimer did his job, reclaiming the souls of the dead knights and choir. Reclaimer for one turn had full soul tokens and was able to fuel the Vanquisher and Repenter, quite effectively. My opponent slowly scraps my Vanquisher, then my repenter. The Sea Dogs advance up the field and engage most of my army and I’m forced to pull out all the stops. Reznik starts killing things, wracking up a few Sea Dogs. The wracks explode killing a model or two. I did this twice in the game, which was fun and uniquely interesting to work into a strategy. The turning point in the game, in my favor, was the failure of the Freebooter to cripple or wreck my Crusader, which I had advanced up field. The poor dice rolls of my opponent only managed to take out the Crusader’s left open fist. You’ll note in the slideshow a lot of wreck markers on the table. During this game, we actually ran out of wreck markers! Sea Dogs, Buccaneer…. and a whole lot more, let by Captain Phinneas Shae. At this point, I can’t remember how useful either of our feats worked for us. They were used up, but didn’t shift the game much. This is a good thing, in terms of fun-factor. Some feats can totally vaccum the enjoyment of playing…seriously. Ultimately, Shae charged and wrecked the Crusader, a mighty feat on his own that I did not expect. I was impressed. The Crusader was pretty healthy. Boo. Anyway, Reznik somehow gets a charge lane that does not involve traversing rough terrain (i.e., the plethora of wreck markers) and it takes 4 swings fueled by Wrack-derived focus and Engine of Destruction to take the wound boxes to zero on Shae. It was a much more contested game than I think I describe here, but it never seemed like I had easy decisions to make. I love games like these, despite their challenges. Last, I should say that my opponent’s army was beautifully (!!!) painted and looked fantastic on the table. I also enjoyed the thematic use of “Sea Pirates”. It was a very fun way to spend my Saturday afternoon. Nearing the end, we run out of wreck markers…. 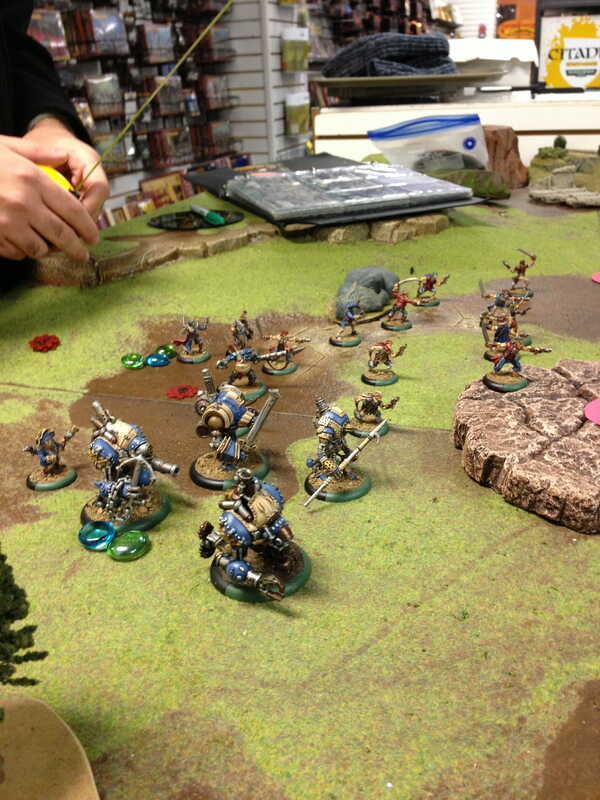 Reznik appears to have a charge lane on Shae, only if he can rid himself of those pesky Sea Dogs in his way. Nice report, Glad to see that hill getting some use — brought it to CWC after finding it gathering dust downs. 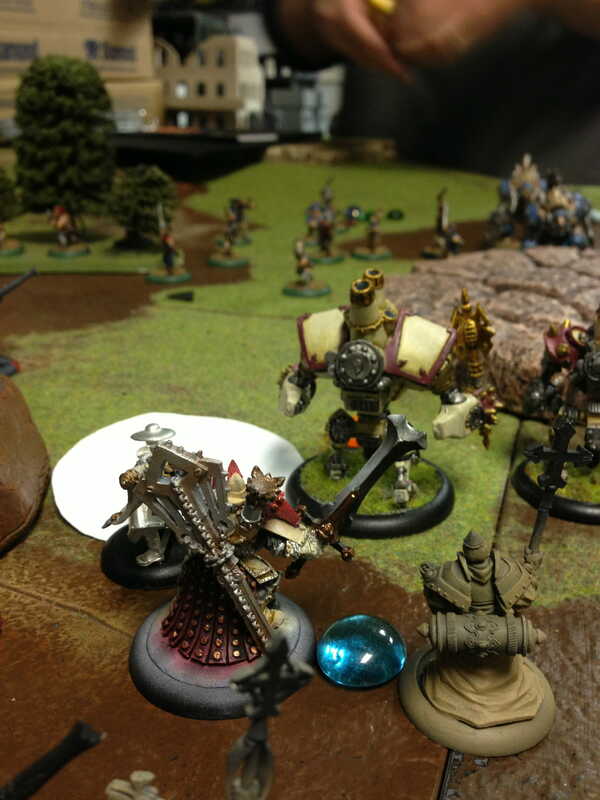 Or is Menoth too good for bacon? hmm, i’m not sure. I’ll have to look into that! 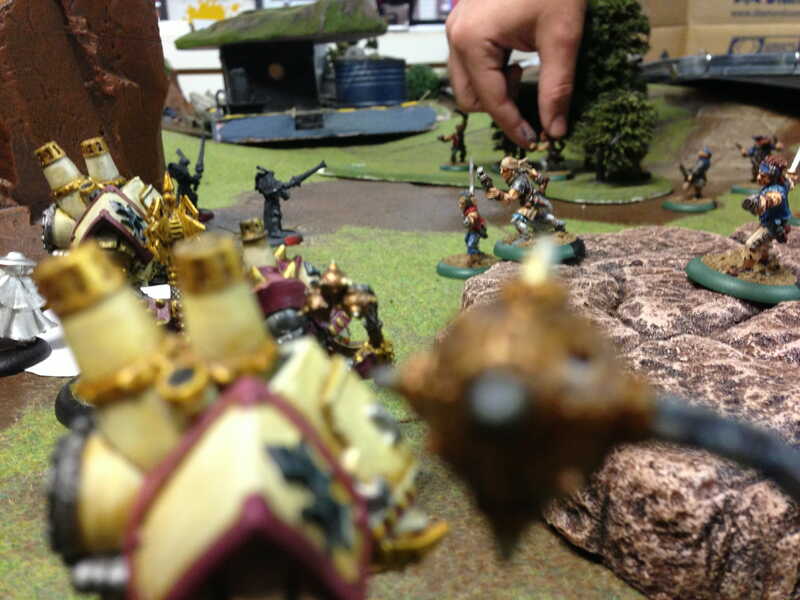 Seems Rorsch is perfectly happy in Menoth’s employ… which means you can build a mini Hordes battlegroup around him. And if I remember correctly, Road Hog throws Sprint to any friendly model.